Believe it when I say this place is a as busy as it looks.. 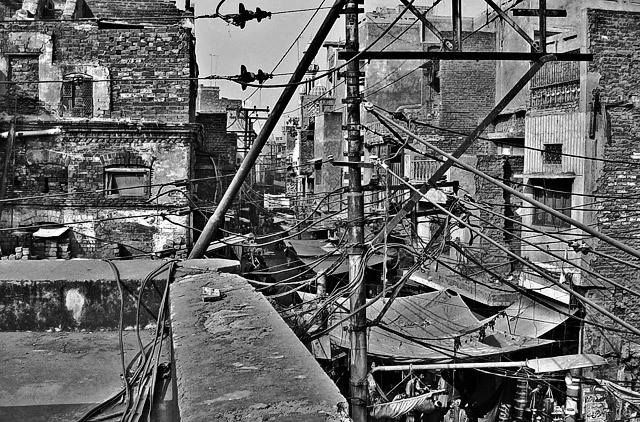 I just used b/w conversion on this place... no hdr.. too sunny for any underexposure..
Help Wanted: Electrician - Must be able to deal with complex wiring systems and high-precision working environments within a high-stakes field..
i love the chaos and the gritty look in this. this place has a very old world look to it, wonder where it is. very nice work. I like the sunny hard light aspect of this photo - but what I like even more is the great lack of any advertising. No billboards, no posters, no neon. It's the raw texture and light I like. The earthy, gritty feel of life is present there and your point of view is great. More photos from this location, please. That is amazing! All the "stuff" going on -- somehow, it really really works in this photo. You get the feeling you are looking at urban chaos, but urban in a very cool way. I like it alot! Message edited by author 2007-03-06 09:44:14. Amazing. I love this photo. Is it HDR? Love the look and effect and the PP. Composition and Clarity are awesome and I love the busy feel, it kept me looking at this photo for a long while. Proudly hosted by Sargasso Networks. Current Server Time: 04/20/2019 04:42:25 PM EDT.